The answer was given by the last century which brought us to choose the concrete represented in one of its purest shapes; the cube. Once chosen a symbol to represent the museum of architecture, the idea was to analyze what is photography more than an image of something existing. We arrived at the conclusion that the ideal way to represent photography was as a negative representation of the existing. Therefore we decided to think about the museum of photography as the mirror negative image of the architecture museum. This made us choose this path of imagining the photo museum as the opposite of the architecture and to use the glass elements to describe a wireframe of the other museum. SITE Santa Fe, committed to presenting the cutting edge in contemporary art and expanding traditional museum experiences, announces a major expansion designed by SHoP Architects. 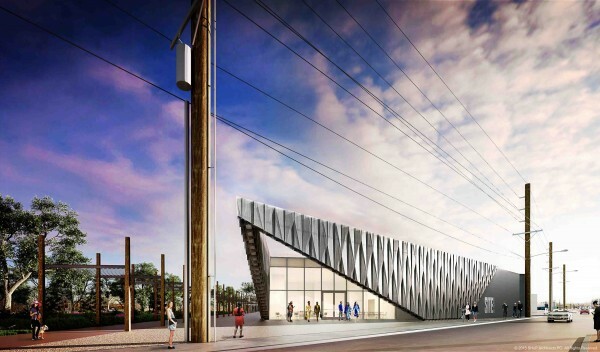 When completed, the new building will greatly enhance SITE Santa Fe’s capacity with a total of 36,000 square feet of interior and exterior space to further serve the creative community and city of Santa Fe. 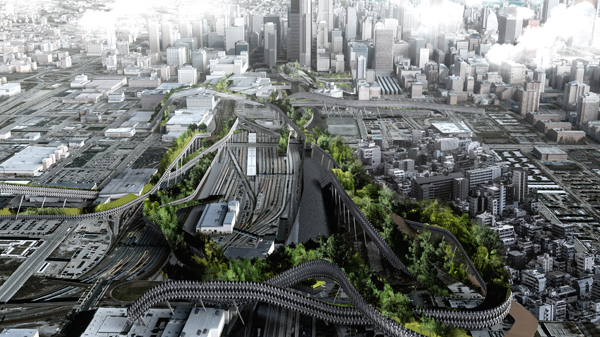 The project will break ground in August 2016 and is slated for completion by summer 2017. The new design will address the critical operational and programmatic needs of SITE’s existing facilities, while creating an iconic new spatial presence for the innovative cultural institution. Located at 1606 Paseo de Peralta-the heart of the burgeoning Santa Fe Railyard, named one of six Great Public Spaces in America this year by the American Planning Association-SITE’s building expansion will continue to lead the next phase of an already active and dynamic public space. Led by SHoP principals, and project director, Ayumi Sugiyama, the design emphasizes SITE’s role as a progressive and dynamic cultural hub, while considering the current structure and SITE’s increased national and international profile. The nearly 15,000 square feet of new interior and exterior spaces represent SITE’s growth and enhanced capacity to present the best in contemporary art and to host more educational programs in-house. Key features of SHoP Architects’ design for SITE Santa Fe include: the new SITElab Exhibition gallery, which will expand to become an 1,800 square foot gallery; a new 3,000 square foot flexible lecture and event space; an Education Lab, featuring a 540 square foot classroom to welcome students from the surrounding areas; and new outdoor gathering and social spaces, including the 1,740 square foot Entrance Sculpture Court and the 1,825 square foot Sky Mezzanine. Crown Resorts Limited (ASX: CWN) and its joint venture partner, Schiavello Group, announced today that award winning British architects, WilkinsonEyre had won the contest to design the proposed new Queensbridge Hotel Tower and precinct to be located in Melbourne’s Southbank area. Crown and Schiavello conducted a global design competition which resulted in five architecture firms being shortlisted – WilkinsonEyre, Bates Smart, Hassell, Foster + Partners and Jean Nouvel. The competition jury selected the proposed design from WilkinsonEyre as the best proposal for the site and were unanimous in their decision. Situated in one of Melbourne’s premier living and leisure destinations and one of Australia’s prime hosting areas for international meetings and events, the proposed Queensbridge Hotel Tower will comprise a 388room, luxury six–star hotel and approximately 680 apartments. The hotel will feature a truly unique special event space and a publicly accessible restaurant, lounge and garden terrace at the top of the tower. 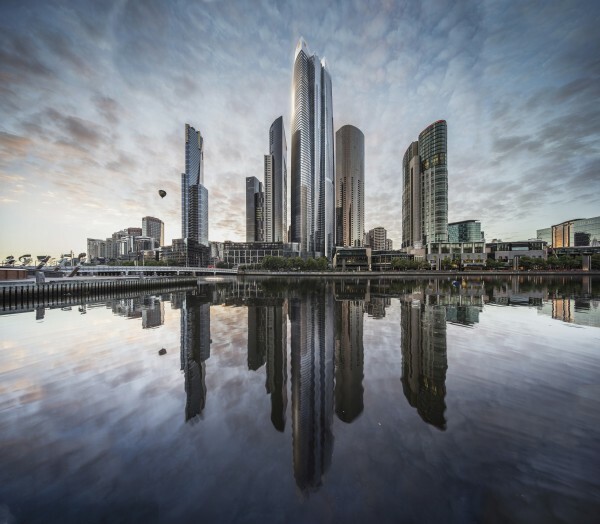 With its three Southbank hotels at nearly full capacity (over 90 percent occupancy), the addition of this luxury hotel will assist Melbourne to meet its future tourist accommodation demands, with Crown being able to offer over 2,000 guest rooms and suites, upon completion. This luxury hotel addition coupled with the recently announced expansion of the Melbourne Convention and Exhibition Centre will reinforce the Southbank precinct’s position as Victoria’s leading tourism, meetings, exhibitions and event destination. A sculptural pedestrian link will provide hotel guests with all-weather access from the lobby of the new luxury hotel to the Crown Melbourne Resort. The joining of this prestigious development to the Crown Melbourne Resort will reinforce Crown’s market leading position in Australia as one of the largest international tourism and business destinations. WilkinsonEyre’s elegant solution for the Queensbridge Hotel Tower will be created by three interlocking sculptural forms providing a graceful and unique addition to the Melbourne skyline. “A new hotel is the next evolution of Crown Melbourne. I am committed to this city and committed to keeping Crown Melbourne at the forefront of Australian tourism. A new Crown hotel means more rooms for interstate and international tourists and that means more jobs for Victorians,” Mr Packer said. “We are confident that the design of the proposed Hotel and the ’one of a kind’ offerings like the ’Sky Bar’ at the top of the tower will be ‘must see’ destinations in Melbourne. We are delighted to have been given the opportunity to design what we believe will be an outstanding addition to the world’s most liveable city,’’ Mr Baker said. The proposed Queensbridge Hotel Tower development remains subject to planning approval, project financing and the finalisation of long form joint venture documentation between Crown and Schiavello. Italian cookery is worldwide appreciated and the very cooking of Bologna excels for many features. Bologna’s C.A.A.B.® will welcome in 2016 such a 80.000 m2 entertainment centre: F.I.CO®. This structure will host swimming pools, restaurants, orchards, beehives, teaching farms and shopping centres. 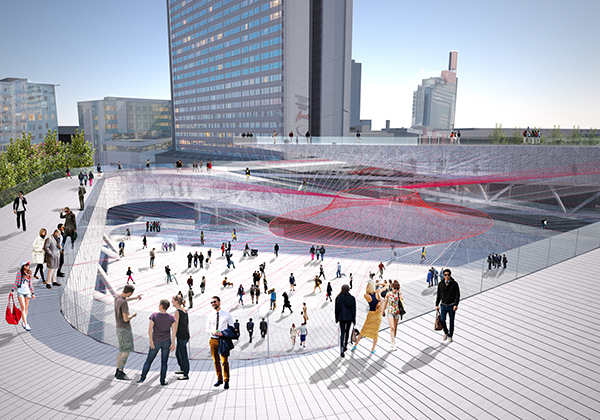 F.I.CO® is planned to become a pivotal international attraction; this will trigger an important territorial redevelopment in order to welcome users and tourist. F.I.CO®.Wellness Club aims to offer a wellness area for those classy visitors willing to discover both nutrition and body care. Italian firm Barberio Colella ARC has proposed its own architectural vision to achieve this objective1. 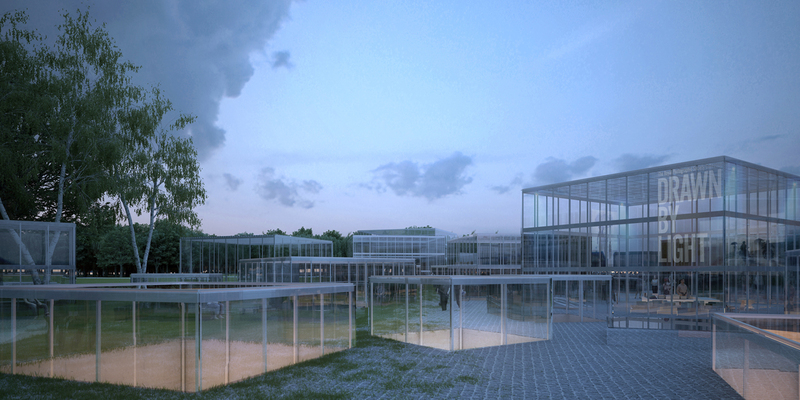 Two main themes leads the whole project: the water and the wood. The water is the most precious element for human life and it generates the wood, one of the most precious materials for human civilization. In fact, at looking the exterior of the building, its shape and its façade, made of translucent material (polycarbonate), look like a drop of dew on a leaf. Instead, the interior is characterized from the particular hue of the wood, a reminiscence of the the colors of the bricks which Bologna is made. 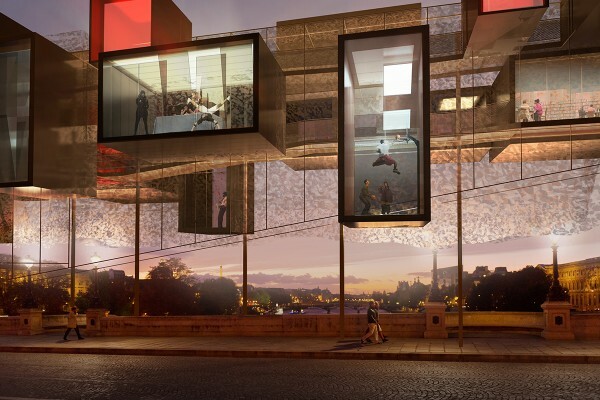 Also the balcony system of the lateral pavilions is inspired by the famous “porticati” of the city. The parabola generated from a water jet, inspires the shape of the envelope and the internal court. 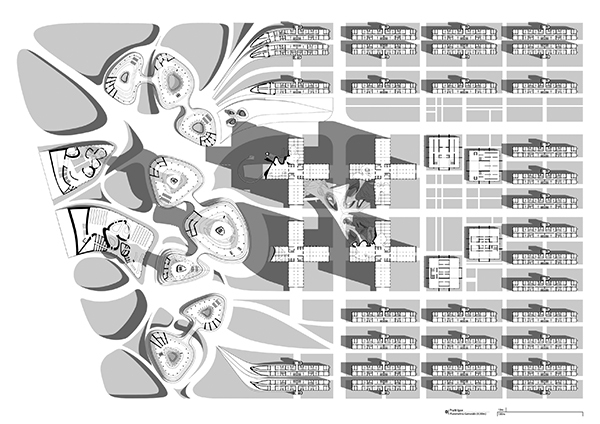 The aggregation of plant cells is the inspiration for the pattern of the whole building envelope and structure. This is a clear reference to plants and wood, using their smallest form of internal organization (the cells) to design the structure. The structure is made of Curved plywood cells based on a parametric design. They are joined together thanks a system of nuts and bolts. A reflective film can keep out as much as 83% of the sun’s heat, dramatically lowering air conditioning costs. In the winter, the same film helps retain interior heat, reducing heating costs. In addition, the internal court is used to improve the passive ventilation in the winter and during the summer. The design for the main building of the trade center follows the motif of an open lotus flower – Vietnam’s national flower – and, with this shape, is intended to become the unique and unmistakable landmark of the city. The image of a blossom is achieved in layout by arranging the exhibition halls like petals around the chalice of a flower. The architectural concept is reinforced by elegant roof structures consisting of pylons with tensile curved roofs, giving the mass of the buildings a delicate appearance. The 128 hectare site benefits from good transport connections and is located to the north of Hanoi on the way to the international Noi Bai airport; in the east-west direction it is divided by a river. 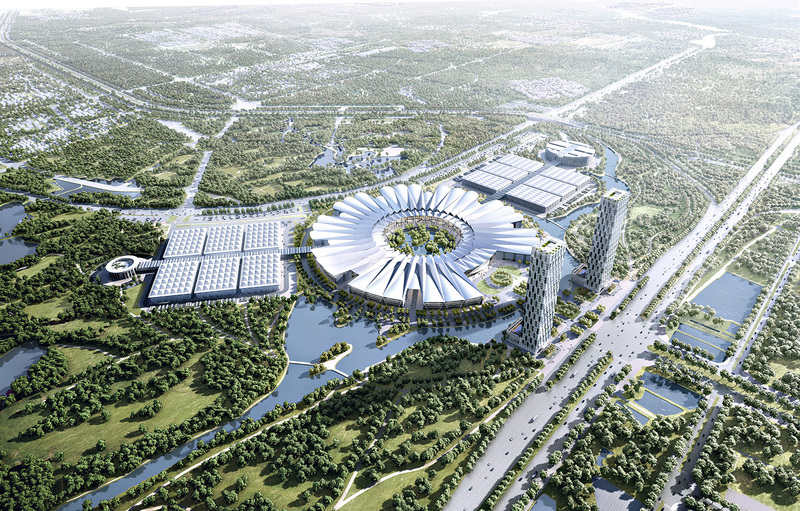 With a gross floor area of more than 600,000 m², the future National Exhibition and Trade Fair Center to the north of the river will be embedded in a green park landscape which extends to the southern side of the river. The entrance to the trade fair will be marked by two high-rise hotel and office blocks, which are placed on either side of the access area and which are visible from afar. The first building phase includes the Trade Fair Center, which consists of a conference center and eight exhibition halls. All buildings are grouped in circular fashion around a central open space, which is designed as a water feature with „islands“ and bridges. The entrance hall is placed to the south and the support-free halls, with an exhibition area of 10,000 m² each, are linked with each other by a ring-shaped building called the „Concourse“. Delivery yards are situated between the various exhibition halls, from where trucks can drive into the sides of the halls; the gates on the sides also serve as connections between the halls. In this way it is possible to combine several areas or separate them from each other, ensuring flexible use and making it possible to organize several trade exhibitions at the same time. In later building phases, six trade fair halls are planned both in the west and the east, which will be combined to a square overall layout shape and connected to the central buildings of the first phase via glazed connecting galleries. In addition, a trade exhibition building for regular trade exhibitions is provided in the eastern part of the site; the building is circular in plan and is placed on its own so that it attracts attention from the motorway and main road. To mirror this arrangement, a smaller circular building has been planned which will form the entrance to the western trade exhibition building when all phases of the development have been completed. All elements of the design are separate building units which can be developed at different times and independently of each other. 7004 house, designed by Daniel Caven, is based upon using natural materials as structural components, the 7004 house is an open air wine house (3 seasons pavilion). Literally taking root, the site is located in the midwest overlooking a private client’s vineyard. 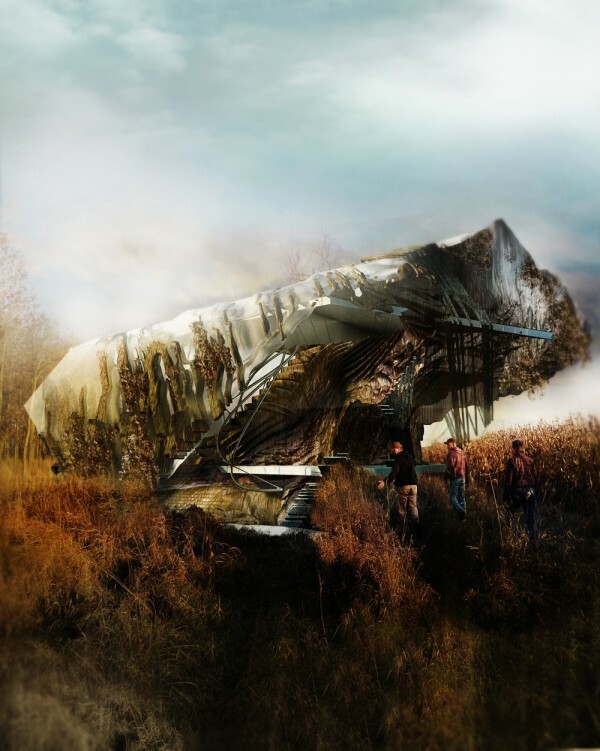 The creation of the house incorporates autonomous natural objects as primitive growths within oriented patterns -allowing nature to overtake structural molds. The molds were based around generations and iterations of natural tree structures, then transformed to structural flow lines for the shell and floors of the house. Allowing for overgrowth to the structures. This project designed by Giacomo Pala is an attempt of developing an investigation about the possibility of having multiple objects contradicting each-other. Instead of a single Object Ontology, this design is a “Motley Ontologies” architecture sided against all of the architectural positivisms. It is an architecture that invokes an ironic, parodic and self-parodic conception of the discipline within the Avant-Garde agenda. This kind of architecture is able to ironically take advantage of the gap between Avant-Garde aspirations and reality, so as to incorporate the concept of multiplicities in the design strategies. In response to mass production, the economic crisis, and the spatial segregation inherent in real-estate prices, this structure designed by Malka Architecture not only co-opts impoverished or outlying spaces, but also upscale places through the use of an active system.